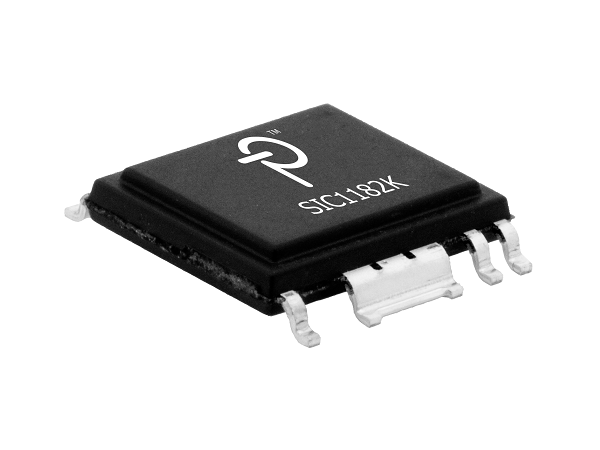 The SIC1182K is a single channel gate driver in an eSOP-R16B package for SiC MOSFETs. Reinforced galvanic isolation is provided by Power Integrations’ revolutionary solid insulator FluxLink technology. Up to ±8 A peak output drive current enables the product to drive devices with nominal currents of up to 600 A (typical). Additional features such as undervoltage lock-out (UVLO) for primary-side and secondary-side and rail-to-rail output with temperature- and process-compensated output impedance guarantee safe operation even in harsh conditions. Furthermore, this gate driver IC has a new feature, advanced active clamping (at turn-off phase), combining short-circuit protection (at and during turn-on phase) as well as overvoltage limitation, through a single sensing pin. If the driven semiconductor provides a current-sense terminal, adjustable over-current detection is supported.